It was a sombre week for Wisma Putra as it said goodbye to two of its own in the past week. The first was former ambassador B. Rajaram, who had last served as Malaysia’s envoy to France. His obituary, which ran in local newspapers, came as a surprise to many who had lost touch with him. The second sad news was through WhatsApp. The Association of Former Malaysian Ambassadors forwarded the news of the passing of former Foreign Affairs Ministry secretary-general Tan Sri Zakaria Mohd Ali. That very same day, former ambassador to Korea Datuk M. Santhananaban wrote an obituary about the man he had known and served under. I never had the honour of meeting either men. But, like many of the greats in the ministry, their reputation reverberated through the generations. As a young foreign service officer, I was often regaled by tales of past exploits of the great diplomats who had walked the path before me. Most of the stories were about the towering icons of Malaysia’s diplomatic world — how they helped shape the external affairs of a young nation, how they made their mark for the country in the world and how they trail-blazed their way into history. 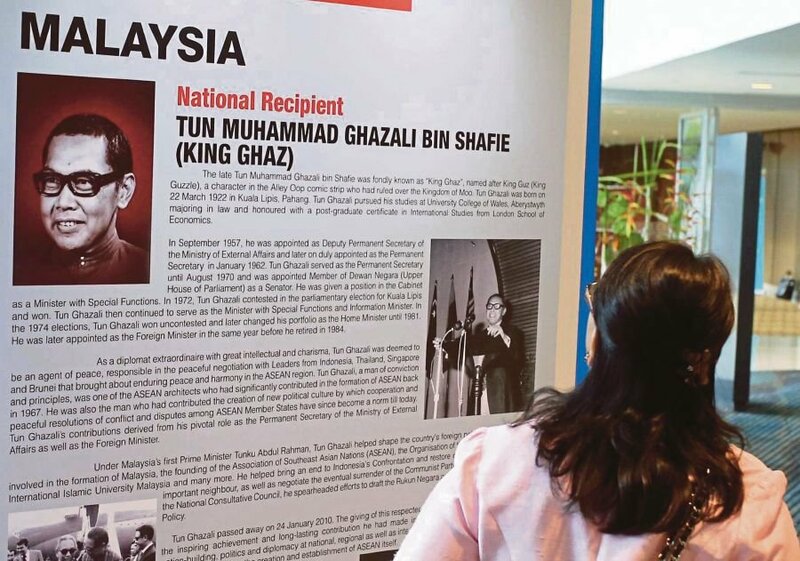 There were the many hand-me-down stories of the omnipresent Tun Muhammad Ghazali Shafie, who, for more than a decade, ruled the ministry, first as its secretary-general, then as its minister. His penchant for morning briefings by his officers left the ministry with the legacy of “morning prayers”, so named because before going into those briefings, officers would offer up a quick prayer that they would not be called upon by the great “King Ghaz”. There were stories of the flamboyant and dashing Tan Sri Zain Azraai, who personified everything a diplomat should be; the Midas touch of Tan Sri Zainal Abidin Sulong, who went from a successful stint as the ministry’s secretary-general to a prolific chairman of the Malaysian Industrial Development Authority; the smooth-talking charm of Datuk Ahmad Mokhtar Selat, who managed to talk his way out of the hostage-taking drama in Peru; and of Malaysia’s first woman ambassador, Tan Sri P.G. Lim, as she took on first the United Nations, then Yugoslavia. These icons are no longer with us, but there are many who are. Their stories need to be “harvested” before we lose the history they lived through. These are stories that made Malaysia an international name, like, how “Dragon Lady” Datuk Ting Wen Lian led the biodiversity charge for developing countries at the Rio Earth Summit, or how Datuk Renji Sathiah manoeuvred the Kyoto Protocol negotiations and became Malaysia’s “face” for climate change, or how Datuk Tunku Nazihah Tunku Mohd Ros was mandated to persuade Prince Sihanouk, then in Pyongyang, to return to Cambodia. Some of these ex-ambassadors managed to pen their memoirs, leaving us with a documented legacy. We are privy to the inner workings of the United Nations through Tan Sri Razali Ismail’s UN Chronicle and general diplomatic life through Datuk Tan Koon San’s Excellency and Datuk Dr Fauziah Mohd Taib’s A Diplomat Arrives in Washington. There are many more greats who have not penned their stories. Among them are Tan Sri Mohd Rastam Isa, former secretary-general of the Foriegn Ministry and now chairman of the Institute of Strategic and International Studies Malaysia; Datuk Albert “Bertie” Talalla, who was the first head of Malaysia’s diplomatic institute; Tan Sri Ahmad Fuzi Abdul Razak, also former ministry secretary-general and now secretary-general of the World Islamic Economic Forum; and Malaysia’s first permanent representative to Asean, Datuk Hsu King Bee. Last year, the ministry held an exhibition celebrating 60 years of diplomacy. In unearthing material for the celebration, the ministry “discovered” some of its lost history. One entire section was dedicated to King Ghaz, courtesy of his family’s generosity with his personal belongings and the medals he received from around the globe. The living institutional memories of ambassadors, diplomats and envoys who had a hand in changing international affairs or experienced first-hand the cutting edge of an evolving world — need to commit pen to paper. Once we lose them, we lose more than just respected elders; we lose our history.